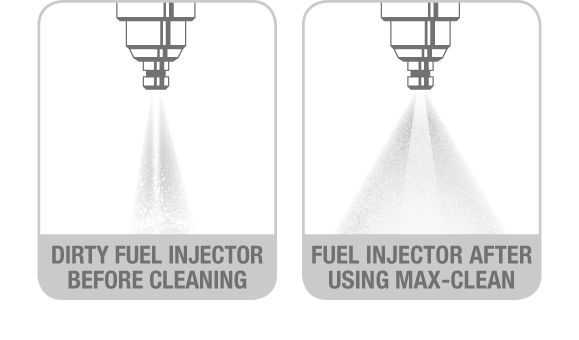 Royal Purple’s New Max-Clean is a state-of-the-art high performance synthetic fuel system cleaner that maximizes the performance of your fuel system. Max-Clean restores fuel economy and deeply penetrates and cleans injectors, carburetors, intake valves and combustion chambers. The illustration below shows the before and after effects of switching to Max Clean. Royal Purple’s Max-Clean is EPA / CARB Compliant. Safe for use in gasoline and diesel engines and can be used with all ethanol blends or biofuel. Max-Clean can be used in both 4-cycle & 2-cycle engines and will not harm vehicle emissions equipment. Pour the entire contents of the can into a nearly empty tank and refuel. One (1) can treats 15 to 20 gallons.